The Irish teenager flies to Melbourne on Sunday ahead of a much-anticipated Grand Slam debut. Carr left school after his Junior Cert in June 2015. TWELVE MONTHS AFTER Georgia Drummy made history in Melbourne, teenager Simon Carr is looking to follow suit as he takes his place in the main draw for the junior Australian Open. Fifteen-year-old Drummy last year become the youngest-ever Irish player to qualify for a Grand Slam event and Carr, who is two years older, has assured Ireland will have at least one representative in Melbourne this month by securing his place in the boys’ tournament. 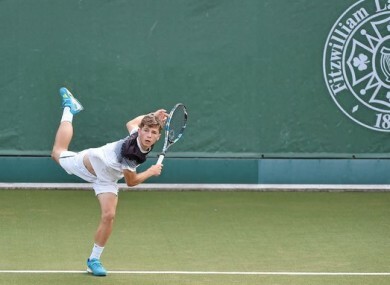 The Mullingar native, and the son of former Dublin footballer Tommy, collected enough points on the ITF Junior World Tour to qualify for his first Gland Slam, which takes place between 16-29 January. Currently sitting 52nd in the Junior World rankings, Carr enjoyed back-to-back victories, in Tunis and Budapest, during the 2016 season and it was those two results which saw him make significant progress up the ladder. “It’s a huge bonus,” the 17-year-old told The42 as he prepares to fly to Melbourne. “It was one of my goals at the end of last year and start of this year to be playing the Grand Slams and to be playing the first one in Australia is great. I’ll hopefully play in Paris, London and New York later in the year. Carr demonstrated his prodigious talent on the court from a young age. He dominated underage tournaments at home and on the continent and was earmarked by Tennis Ireland as a future star for the last number of years. After completing his Junior Certificate in Mullingar CBS, Carr left school to chase his dream of becoming Ireland’s first tennis star, a journey he has embarked on with the help of his family and coach, Gary Cahill. The natural path for Irish teenagers is to seek a scholarship in America, earn a rich tennis and academic education in the States and hope it manifests itself into some sort of sustainable career. But Carr took the decision to get ahead of the curve and going solo at such a young age has seen him compete on two fronts — the Junior and Future Tours — in order to gain as much experience and exposure as possible. “It’s gone very well actually, winning my first two Junior events and getting my first ATP points and building on those was great,” he continues. “I’m just trying to climb up rankings. In the space of 18 months, Carr has jumped from 500 to 52 in the junior rankings; an indication of the progress he’s made and the promise shown on the road most weeks of the year. After sealing his place at the Australian Open towards the back end of last year, Carr has been able to shape his schedule around preparations for Down Under and this afternoon played a final exhibition match against Bjorn Thomson in DCU before flying out at the weekend. It was a valuable exercise, particularly considering he was forced to return home early from a tournament in Turkey before Christmas with shin splints. “I’ve a few niggles but I’m feeling good,” he insists. “The shin splints have caused a small bit of bother but we’re managing fine. Carr won’t learn the identity of his first opponent or which side of the draw he’s on until 24 hours before his first outing at Melbourne Park — but at the moment all he’s concentrating on is getting out there and seizing his chance on the big stage. “I’m focusing on the process as much as anything and hopefully the results will come,” he adds. Email “The Wizard of Oz! 17-year-old Simon Carr ready to seize his chance at Australian Open”. Feedback on “The Wizard of Oz! 17-year-old Simon Carr ready to seize his chance at Australian Open”.